After the devastating battle at the Tower of Charm, Croaker leads the greatly diminished Black Company south, in search of the lost Annals. Every step of the way the Company is hounded by shadowy figures and carrion-eating crows. As they march ever southward, through bug infested jungle, rivers dense with bloodthirsty pirates, and cities both dead and living, their numbers grow until they are thousands strong. But always they are watched by the Shadowmasters, twisted creatures that deal in darkness and death; powerful, shadowy creatures bent on smothering the world in their foul embrace. This is the first round in a deadly game (goodreads.com). Chronicles of the Black Company was one of the best fantasy novels I have read in a long time. 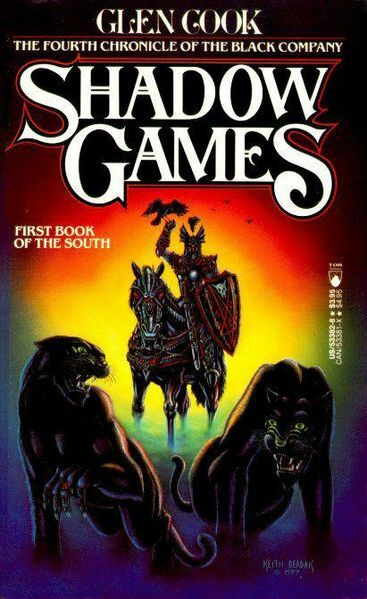 I was excited to begin the next set of the Black Company novels in Books of the South. Even though I read the omnibus edition I wil post these books separately because I have much to say. According to Goodreads, Shadow Games is apparently the fifth installment of the Chronicles of the Black Company. It is preceded by The Silver Spike. However, in the Omnibus edition, Shadow Games comes first, so this is the one that I read first. Shadow Games picks up right where the previous book endend. It is entertaining, but a bit slower starting off than all the others and the book raises more questions than it answers, so you will want to move right on to the next book. There is also plenty of intrigue and many surprises along the way. Much of the novel is spent reading about who is left of the Black Company and their travels south to Khatoavr. They pick up many new recruits on the way and end up spending the last part of the novel in and around a city called Taglios. This is where they find their new “boss”, the prince Prah Drah (as I call him). The ending of the book is fantastic and the battle scenes are amazing and intense! The things that really kept me interested in the book were the shenanigans of One-Eye and Goblin; they are hilarious! It was also interesting to see Lady as a more human character; she is one of the most interesting I think. As always, Croaker is awesome! Unfortunately, there are many new additions to the Black Company, which I didn’t like because it was difficult to get to know them. Hopefully, we learn more about them in the next book. I also, didn’t like that the names of many of the characters (and places) were hard to remember and pronounce. I wish they would have been a bit more simple. Oh well. This particular book is still written in the perspective of Croaker who is the annalist, physician, and captain. I love reading in the POV of Croaker! You also read about some other characters in the third-person, who play important roles later on in the book. The writing is fantastic! I loved this book and am going to continue right on to the next one! I highly recommend reading this series! I recommend reading the omnibus edition which includes Shadow Games, Dreams of Steel, and The Silver Spike. It is a great addition!